A unique 1200 sq ft home with beautifully carved antique doors and pillars from India, inside and out. The living area of the house is 1200+ square feet divided into two 600 sq ft open spaces that are separated by a beautiful antique interior door. The “studio” space has 20 ft ceilings with a stand-up loft sleeping area with a double platform bed. There is a large living area with a sofa that has an extra-long queen size pullout bed, and a kitchenette. The “main” space has beautiful 11 ft ceilings with vigas. This area has a bedroom alcove with a queen size bed, a full kitchen, dining area, and a sitting area. You have beautiful views of the mountains to the east and the valley to the west--the sunsets are breathtaking. The area is quiet and peaceful with a lovely garden around the house. There is easy access to the ski valley as well as the center of Taos--8 miles in either direction. There is fine and casual dining nearby as well as an organic super market on our side of town. The village of Arroyo Seco is charming with its restaurants and shops and within walking distance of the house. My name is Barbara and here I am at the Rio Grande Gorge. I fell in love with Taos on my first visit to New Mexico when I bought my home. I love Taos with its casual and laid back approach to life. Its multiculturalism makes it a very interesting place. There are celebrations at the Taos pueblo, events such as the rodeo, the film festival, the wool festival, home and garden tours, and artist studio tours to mention a few at various times of the year. But my favorite activities are hiking and skiing in order to enjoy nature and the beauty that surrounds me. I fell in love with my home in Taos because of the beautiful Sangre de Christo Mountains, which give me a feeling of peace and serenity. The dry fresh air at 7.000 feet above sea level along with 300 days of sun is comfort no matter what the season. My home has been completely refurbished inside and out. The home and garden are very clean and neat. It is in an ideal location for quiet, yet convenient to both town and the ski valley. Housekeeping is available upon request. It is an ideal rental for two couples, with complete privacy, or a family with two to three children, or a group of two to three friends. One bathroom has a tub and the other a shower stall. A charming Village that you can walk to from the Casita--check out the Arroyo Seco website. 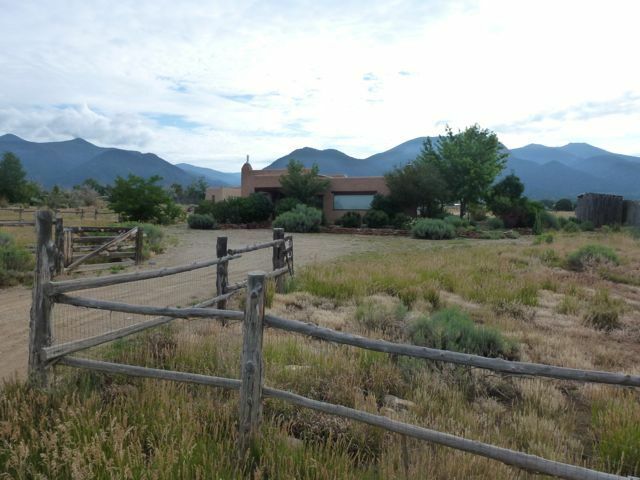 Beautiful views of the Sangre de Christo mountains to the east and the valley to the west. The immediate view across the street is of beautiful horses in a field. It is very serene and peaceful. We love this house, stayed here several times! Great for a family and everyone wanting to hang out! Thank you Tonna! We are so glad that you and your family enjoyed yourselves. This home was just right for our family trip to the Taos area. There was plenty of room and it was very clean, with beautiful views. We liked to open the windows at night and let the cool summer breeze blow through. It's on a quiet road and easy to head up to the ski valley or down to Taos. The shops in Arroyo Seco are just a couple of minutes away. We'd definitely stay here again. Thank you Joe! We enjoyed having you. Family ski trip to Taos! Great experience! Awesome place. Love the look of the decor, old world style. Perfect location to ski and less than a few minutes to shops and restaurants! I highly recommend! My family of 5 stayed comfortably. Our family of 5 stayed at Anahata Casita over spring break (March) and thoroughly enjoyed our stay. The house can divide easily to provide privacy for parents and kids, and the kitchen and dining area are a great fit for 5-6. The Casita is located about 10-15 minutes from the slopes at Taos, and the town of Arroyo Seco has a world class ice cream shop and a few good eating options, too just a minute or two from the house. We hope to stay again in the future, and highly recommend it for a family or group of travelers. The management aspect was very easy, too--overall an excellent experience! Thank you very much for your review of the Anahata Casita.